SEWELL – It’s not that the Eastern girls’ soccer team has forgotten what happened just two weeks ago. It certainly did not escape the Vikings (14-2 overall, 8-2 division) that a shot at an Olympic American title went by the wayside with consecutive losses to Washington Township and then Shawnee in a three-day stretch. It’s also clear the Vikings are well aware that Shawnee (11-1-2, 8-1-1) claimed that same title this week. The thing is when a division includes Shawnee, entering Sunday No.1 in the South Jersey Coaches Association Top 20 and No.3 Washington Township, long with Cherry Hill East, Lenape and Cherokee, perfect seasons are far and few between. So equipped with a division title from last year, the Vikings travelled to Washington Township on Saturday more pragmatic than foaming at the mouth seeking revenge for a one-goal loss at home two weeks ago. Instead, the Vikings have different objectives. “State title,” junior Kelli McGroarty said. “That’s the goal. The team goals come first and that’s the big goal we have had from the first day of practice. We can’t win the conference but we still have two of our biggest goals as a team left, the Coaches Tournament and a state title. That said McGroarty scored a hat trick to bring her season total to a team-high 23 and sophomore Riley Tiernan registered a school record 20th assist this season as the Vikings beat Washington Township 3-1 in the final Olympic American this season for both squads. Both teams are positioned for runs in the Coaches Tournament, which the pairings for the 16-team tournament will come out Sunday and the New Jersey Group 4 tournament but on this day, the Vikings held the upper hand. Washington Township, which also lost senior Natasha Munro midway through the first half with an injury, opened the scoring when sophomore Megan Smith, found the net with 24:39 left in the first half. Smith’s second career varsity goal and first this season on her recent call-up from Junior Varsity had the Minutemaids feeling confident. A confidence that proved short-lived as McGroarty found her way just outside the Township 18-yard line where she knotted the game at 1-1 just three minutes later. McGroarty wasted little time in the second half as she scored 4:08 into the half and then again, on possibly her best shot of the afternoon, a shot from outside the 18-yard line that curved into the near post for a 3-1 lead with 24:06 left to play. To its credit, Township tried to fight its way back into the game but failed to manage any really quality opportunities. Still, these two programs know very well that the season is far from over. E: Kelli McGroarty 3; WT Megan Smith. 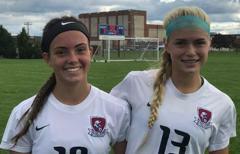 Junior Kelli McGroarty scored a hat trick to give her 23 goals this season and sophomore Riley Tiernan set a school mark for assists in a season with her 20th in a 3-1 win over Washington Township.